A narrow, sloped swath between the brick home and a rustic forested area made up the whole of the homeowner’s back yard. 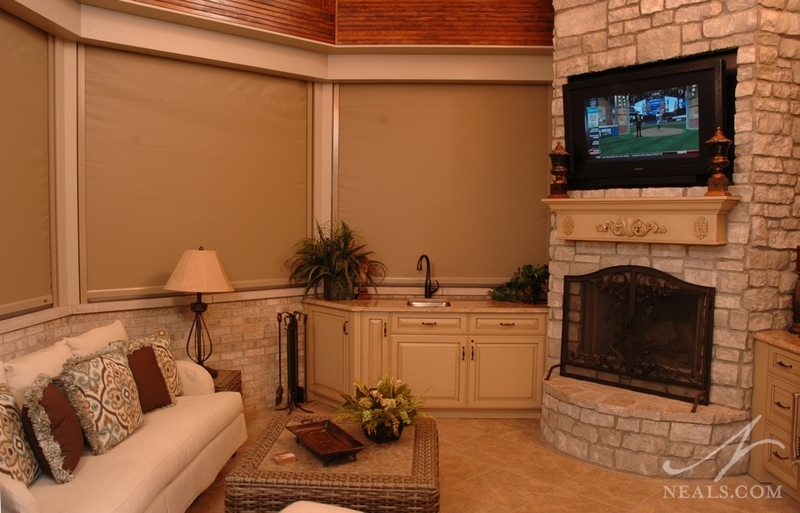 While they loved the open view, they also desired to improve the livability of the area by introducing a covered structure for year-round outdoor living. The project offered a number of challenges, but for the homeowners, maintaining their view, improving their privacy, and creating a comfortable space were the goals that mattered the most. 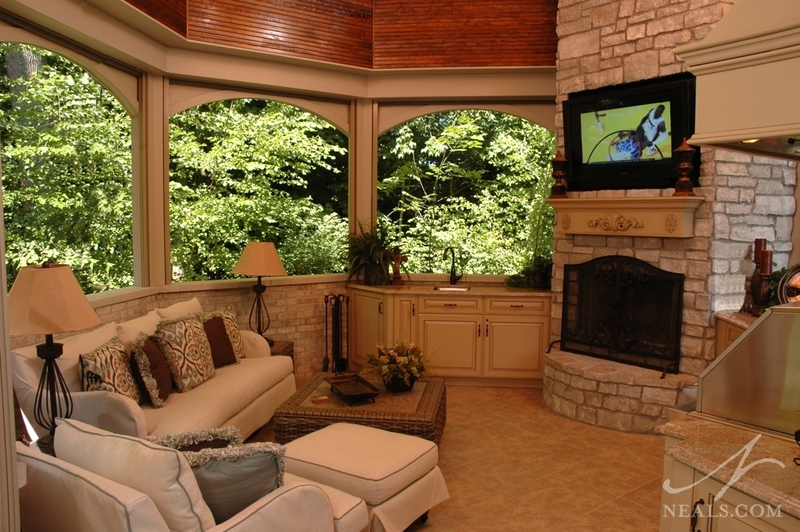 Create a cozy, private outdoor living space that did not destroy the homeowner’s view from the back of the house. Maintaining the character of the home and neighborhood. 1. The new pavilion took advantage of an area at the far end of the yard near the driveway, rather than directly behind the house. The decision to place the pavilion on one side of the yard, where there was little landscaping and a wooden retaining wall felt like a shabby addition to the yard, was a major factor in the success of this project. With no windows to block, the pavilion could take full advantage of the area without inhibiting the view. In addition, and also of great importance was that the placement of the pavilion at the end of the yard helped to block the view from the neighbor’s pool into the homeowner’s yard, greatly improving privacy. 2. 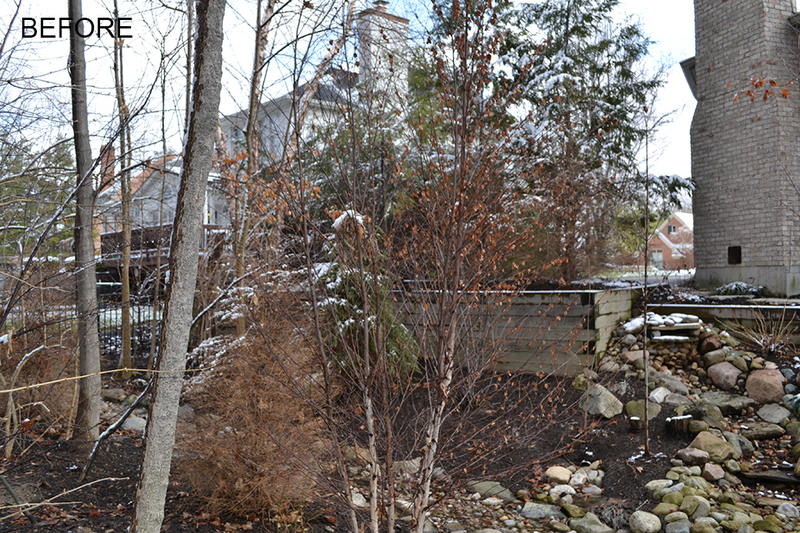 The retaining wall and slope were removed to create a poured foundation. The space between the driveway pavement and a drainage creek at the base of the hill was cleared and dug out to create a level foundation. A poured slab was then built up to the height of the driveway and house with brick matching the home’s exterior. The pavilion’s base creates a more dramatic landscape by highlighting the grade of the remaining yard around it. 3. The landscaped waterfall’s apex was moved to make room for the new pavilion and landscaping without completely removing it. One of the nice features of the existing site was a waterfall landscaped into the slope that also provided additional water drainage. With the modification of the grade due to the pavilion’s foundation, the waterfall could no longer meander across the slope, but the homeowners did not wish to lose it. 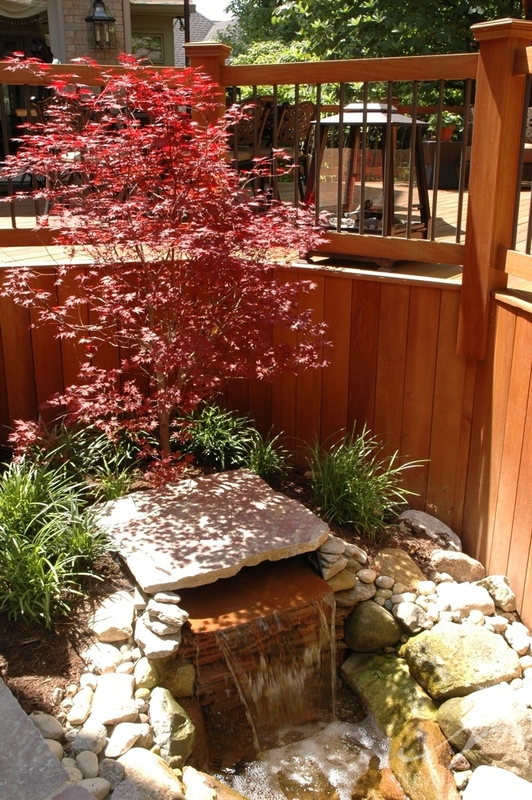 The bed was turned and shifted over to flow from the other direction with a new fountain at its top and the existing drainage creek at the bottom. 4. Select walls of the octagonal pavilion were utilized as solid walls for both interior comfort and specific components of the structure’s privacy. 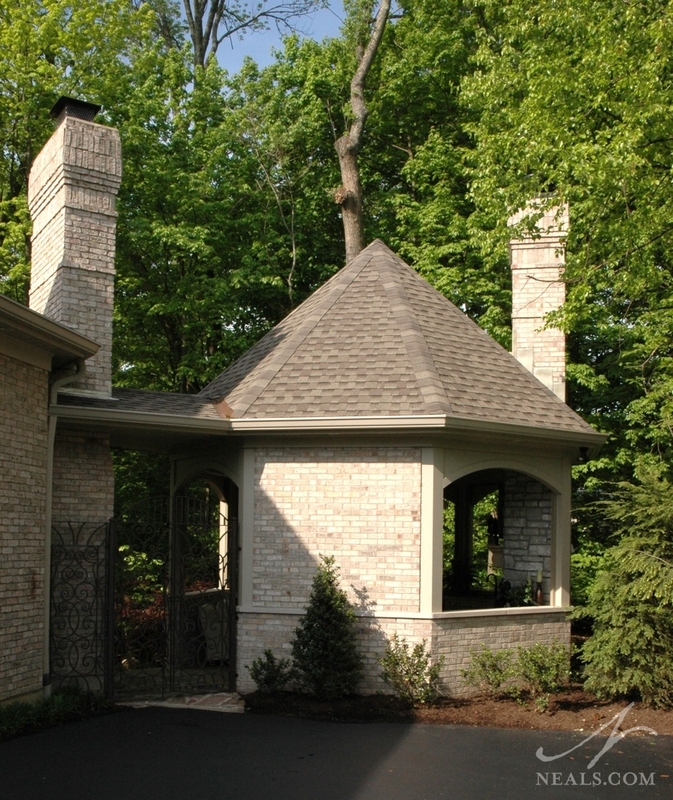 In order to provide the open quality the homeowners desired, the pavilion was designed like a gazebo, with openings between the roof supports. 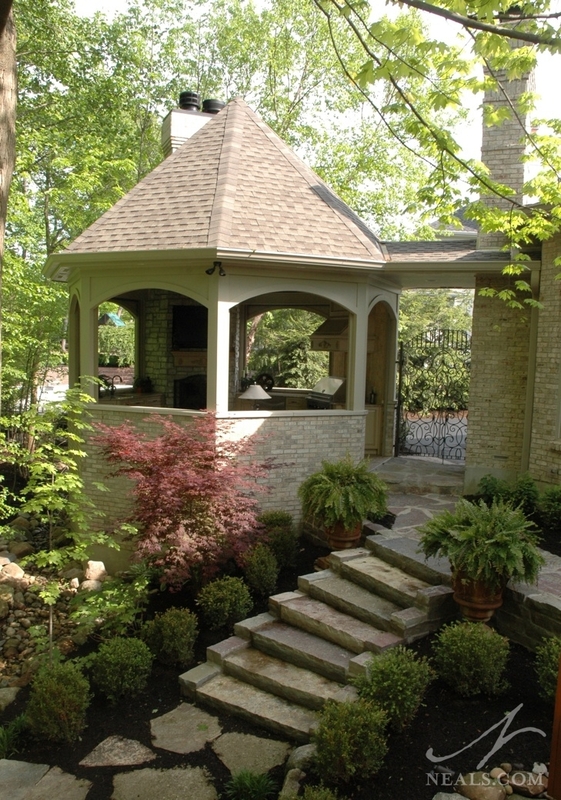 While this feature was great for the landscape, privacy was still a concern, since the pavilion was placed to block the neighbor and was fully visible from the driveway. Two walls, one facing the neighbor, one facing the driveway, were chosen as the locations for a fireplace and range respectively, which made the best use of the solid walls, masking their role as privacy screens. 5. An outdoor vestibule between the driveway and the back yard ties the structure to the house, while a new stone path extends the hardscaping into the yard. Rather than leaving the pavilion as an independent structure and missing the opportunity to introduce coziness outside it, a small roof bridges the narrow space between the pavilion and the house. This narrow alley creates a small room-like area before directing traffic into the pavilion or out back along a new flagstone path to the deck. A set of stairs breaking off the path leads down to a storage area below the deck. On the front of this hallway, an intricate wrought iron gate enhances the hallway’s entrance-like aspects. 6. In addition to heating elements within the pavilion, motorized screens, designed for year-round use, were installed in each of the structure’s openings. When the weather turns wet or cold, rather than abandon the pavilion and lose the additional living space until warmer weather, the structure can tap into practical weatherization elements. The fully functional fireplace offers one source of warmth, even on cool summer nights. A unit mounted on the ceiling provides both heating and air conditioning. These work best when combined with the pavilion’s screened openings. Motors housed in the roof support structure make quick work of lowering or opening the shades. 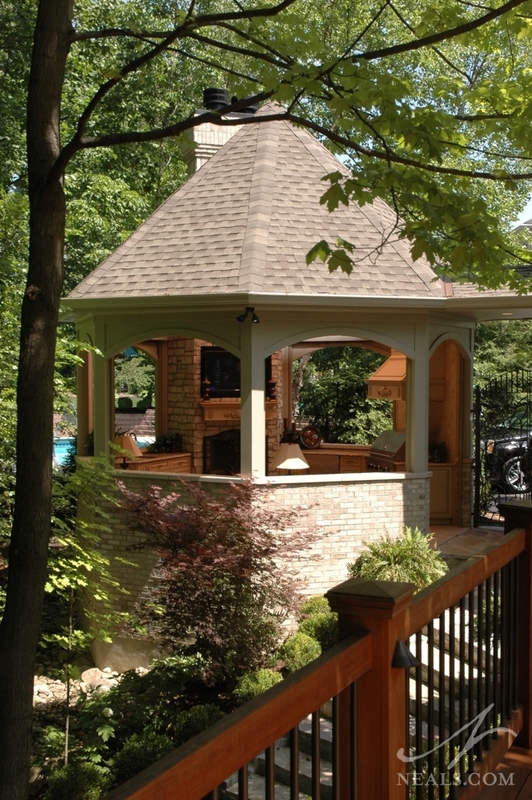 These handy shades are yet another element of privacy that make this gazebo structure work for the homeowners. 7. Interior style, features, cabinets, and materials create a high end space, designed to look and feel like a true extension of the home. Stepping into the pavilion, it’s easy to forget that the structure is outside. A cream-based collection of tile, cabinetry, stonework and trims provides a wide variety of textures but allow the changing seasons outside to imbue its own brand of variety and character. 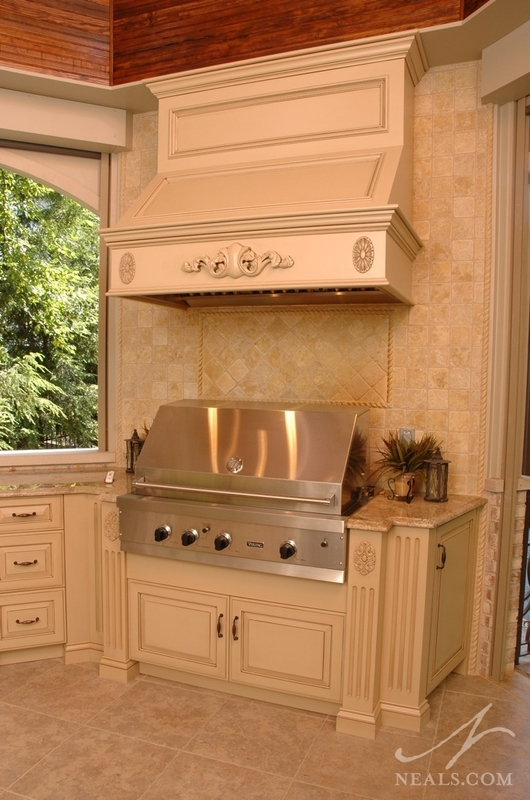 The outdoor range, fit into a chef kitchen setting, complete with a hood above, provides additional function to the space without making it feel like just another backyard grill.